Average Weight	: 10 - 25 lbs. Bred down in size from pit-fighting dogs of the bull and terrier types, the Boston Terrier originally weighed up to 44 pounds (20 kg) (Olde Boston Bulldogge). It is difficult to believe that these stylish, little dogs were once tough pit-fighters. In fact, their weight classifications were once divided as lightweight, middle and heavyweight. Originating in the city of Boston, Massachusetts, the Boston Terrier is one of the few breeds developed in the USA. The original Boston Terriers were a cross between the English Bulldog and the now extinct English White Terrier. Around 1865, the coachmen employed by the wealthy people of Boston began to interbreed some of the dogs owned by their employers. One of these crosses, between an English White Terrier and an English Bulldog, resulted in a dog named Hooper's Judge. Judge weighed over 30 pounds (13.5 kg). He was bred down in size with a smaller female and one of those male pups was bred to yet a smaller female. Their offspring interbred with one or more French Bulldogs, providing the foundation for the Boston Terrier. By 1889 the breed had become sufficiently popular in Boston that fanciers formed the American Bull Terrier Club, but this proposed name was not well liked by Bull Terrier lovers. While we all know & agree that the Boston Terrier was developed in the late 1800s in Boston, Massachusetts, there are varying stories about how the breed came to be. There is a wonderful story that coachmen of wealthy families developed the breed by crossing Bulldogs and the now extinct English White Terrier to create a new dog-fighting breed. Another account is that a Bostonian named Robert C. Hooper imported an Bulldog/English Terrier cross named Judge from England in 1865 because he reminded Hooper of a dog he'd had in his childhood. Yet another story is that Hooper purchased Judge from another Bostonian, William O'Brian, around 1870.
Who knows which story is true, but the fact is that there was, indeed, a dog named Judge, and that from him, came the breed we know today as the Boston Terrier. Lively and affectionate, extremely loveable. Can be stubborn, with sudden spurts of hyperactivity. Also can be typically quiet, gentle and not prone to 'yappiness' like other small breeds. Because of their skull structure, and more 'flattened' noses, they can have respiratory problems ~ better that you use a harness vs. a collar that bothers their neck. Can be over-eaters, so monitor their food intake. Their nose structure also leads this breed to snort, drool and snore loudly. Also prone to 'corneal ulcers' due to their large, prominent eyes. Also known for 'passing gas' ~ otherwise known as 'flatulence'. .....Something to think about! The temperament of a Boston is hard to describe. They are unlike any other breed there is. They are very loving, caring, wanting to please at all times. It takes a lot to make a Boston mad, but when they do get upset they walk away. They are very easy to train, they love to learn, and catch on very fast. They are quite sensitive to the tone of your voice, using a harsh tone will upset them and when they are upset their face shows it. Many Boston owners have said they make great watch dogs and only bark when they feel it's a must. Others say their females don't bark at all. They are great with kids, great for the elderly and friendly to strangers once they are sure the stranger is not going to harm their family. They are a very playful breed, very affectionate, and very much a part of the family, and very popular in the United States because of its excellent character. Although they love to please and are easy to train, house breaking can be a small problem. Over all a Boston is a gentle, alert, very intelligent, and well-mannered dog. With their short faces they can have problems breathing, especially when stressed or hot. Some can have problems with Allergies as well. Their big, buggy eyes are easy to harm. The biggest eye problem is Corneal Ulcers. Around 1 in 10 will experience Corneal Ulcers in their life time. Corneal Ulcers are caused initially by injury to the eyes. They are also prone to Cataracts and Juvenile Cataracts. Deafness has been known to occur in Boston's sense the beginning of the breed. Deafness can occur in any Boston, but it is more prone to affect Bostons that have one or both eye blue or white and there offspring. .
Ingrown or corkscrew tails can become a serious problem. The tail grows backwards and down creating a deep crevice that can become painful and infected. In severe cases the tails need amputated. Milder cases require attention to keeping the area clean and dry to maintain the pet's comfort. Bostons have a thin, fine, short coat. They do not shed much and little grooming is needed. An occasional brushing with a firm bristle brush is enough. However the face should be cleaned with a damp cloth daily and nails need to be clipped occasionally. They can also get dry skin, but nothing a good conditioner can't take care of. They also should have the occasional bath and a good cleaning around the tail every other week, more or less depending on how dirty your Boston gets, how hard they play, and if they decided to roll in a mud puddle. Grooming a Boston is very easy. They enjoy being brushed, and usually don't mind their feet being touched. 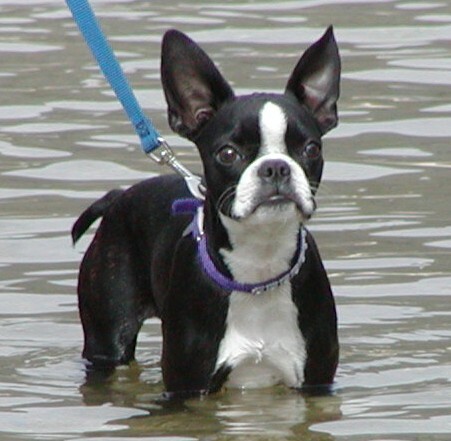 Boston Terriers are not great swimmers...... are not fond of water so they may shake a little during a bath. While clipping make sure not to clip very much nail off. If you clip off too much they will bleed. If this happens, apply corn starch or flour on the nail. The bleeding may last awhile but your Boston will be fine. Bostons Do not need a lot of exercise. They love going for walks, however interactive play provides them with more than enough exercise with the attention he craves and loves. You should never push your Boston to exercise outside in extreme temperatures because they cannot handle intense heat or cold. Always remember that they may have difficulty breathing due to their short muzzle, so be careful with strenuous exercise. Bostons are very happy doing anything from playing fetch inside to going on hikes with you. Just make sure you have plenty of water and are able to break when they need to so they don't overheat. Bostons terriers are very easy to train. They love to please, they love to learn, and catch on very fast. They can be a little slow when it comes to house training but they will catch on quicker than many breeds. They are very sensitive to the tone in your voice, speak harshly to your Boston and you will see the sadness in his eyes. They learn well if you spend a lot of time with them. They are social little guys and crave attention. They need proper socialization at an early age because sometimes males can be quite territorial. Using small treats and praising works well for Bostons, they respond to positive reinforcement better than discipline. A happy Boston is a Boston that is ready to learn and ready to please. There is nothing better than a happy Boston terrier. Stay consistent and take at least a few minutes to train each day. Do not stretch each a training period too long or your Boston will get bored. Mix it up and work on one trick for a few minutes, then go to another. Wile training a Boston, a small bag of cut-up hot dogs will become very useful. Make it fun. Remember a Boston wants to please you. Turn training into a game you both will enjoy, that way your Boston won't get bored and nether will you.